Or maybe how it would feel to be trapped in a horror movie like Saw or Silence of the Lambs? Could you escape a maximum security prison or survive a night in a Haunted Asylum, or break into a bank vault to steal a priceless jewel without setting off the alarms? The creators of The 13th Gate Haunted House are proud to present a new concept of interactive entertainment... a real life escape experience! The last thing you remember was going up to the van to help some guy who was having engine trouble. Then a sharp sudden pain in the back of your head and everything went black. Now as you try to sit up, your senses slowly come back to you. You realize that you are trapped in the bottom of a deep well. Above, way out of reach, you see a light and hear muffled laughter. Can you solve the killer's sick puzzles and make it out of his house of horrors before he returns to make you his next victim? It doesn't matter that you are innocent and were set up. The only thing that matters now is that you are inmates in Louisiana's Maximum Security Prison and will be executed in less than an hour. Due to overcrowding, the Warden has been forced to temporarily place you in the old E-Block. The guards say E-Block was closed over 40 years ago due to a gas leak but some of the older inmates say that it really had to do with a prisoner who escaped and was never found. They say that he vanished right out of his cell and since no one could figure out how he did it, out of frustration the warden ordered the entire cell block closed... until now! Are the rumors true? Did someone really break out? Is there a secret way out? Can you escape before your time is up and the guards come back to get you? When you booked a visit to see the great pyramids, you thought it would be more interesting. But as the tour guide drones on about the different types of ancient pottery, you decide you could have more fun if you were exploring on your own. When no one is looking you quietly slip away from the group and make your way down a dark passage marked "Unmapped area. Do Not Enter!". After a bit of exploring you walk into a small dark room and suddenly a stone door closes behind you. You realize all too late that you are trapped. You look around the room and to your horror you see the corpses of other "explorers" and realize that you have walked into an ancient trap. Can you uncover the mysteries of the pyramid and escape before time runs out? Or will this tomb be your own final resting place? Your mission, should you choose to accept it, is to locate our missing operative, Agent 13, and carry out his last objective. We are sending you to his last known location where he was investigating a lead that the notorious international villain, known only as The Shadow, had a secret location nearby. Agent 13’s last transmission was that he had discovered a deadly bioweapon hidden deep within a secret underground missile base. This weapon was set to launch TODAY. If this information is true, Time is running out. You have one hour to find the base, overcome any defenses you encounter, discover the fate of the missing agent, and locate and disarm this weapon of mass destruction before it launches. "Please return to your room and don't try to escape again. The doctor has explained to you that this is not an 'escape game'. Try to remember who you really are. You are a patient here and suffer from a delusional disorder. Try to lie down and get some rest. There is a bad storm coming and the last one we had knocked out all the power so we can't be worried about what you are doing tonight. "I'm afraid the doctor has scheduled that frontal lobotomy he talked about for first thing in the morning. I hate to see that happen to you but you are increasingly agitated and he sees you as a danger to yourself and others. I'll be back in an hour to give you a shot that will help you sleep and tomorrow everything will get better. Remember, we are here to help you." Can you remember who you are? Are you really a patient? Is this only a game? 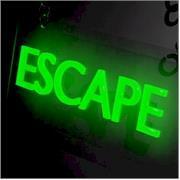 Can you escape before time runs out?